After impulsively accepting a position as governess to the Louvayne family, the reclusive new occupants of long-abandoned Windlake mansion, Jennie Maxwell finds herself embroiled in an infernal battle-of-the-wills for possession of her young ward. 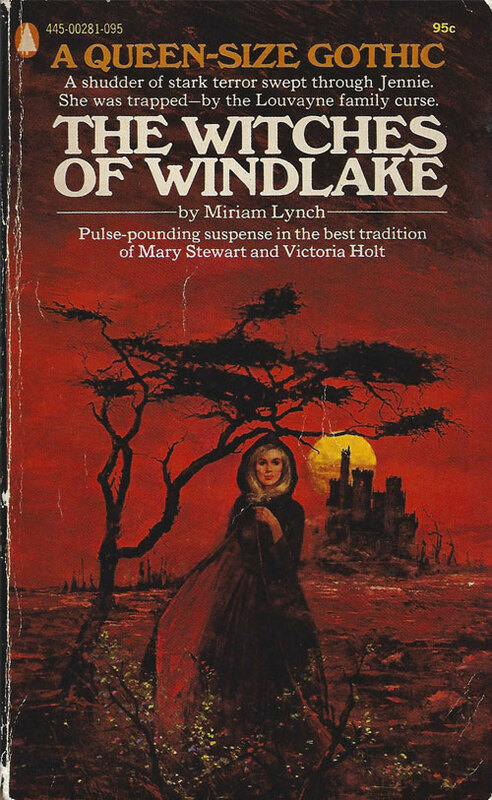 Indeed, a trio of women does arrive unexpectedly at Windlake–or perhaps to the Louvaynes, not as unexpectedly as foretold. Like some gothic romance variation on Macbeth’s three weird sisters, Franzi’s mother, Josepha Hanar, and two sisters, Lenya and Ilse, descend upon the manor after chasing the Louvaynes across the Atlantic. Of course, they are also witches, immediately emasculating Victor and sending Ottalie into a resigned compliance. The Hanar women barely contain their scorn for Jennie, and openly challenge her for control over Julian. Julian, a treacly darling smitten with Jennie, is also something of a petulant child, subject to uncontrollable temper tantrums and in need of complicated story-telling games to coerce his actions. Jennie alternates between convincing him to role play in these games and violently yanking his collar when apoplexy strikes. Perhaps Julian’s aggressively childish behavior should be forgiven, however, because….Satan. Jennie herself pauses on occasion to reflect upon the inherent creepiness of her latent romance with Victor. Objectively, he seduces an employee who bears an uncanny resemblance to his late wife, dresses her in his late wife’s clothing, and sets her up in the role of replacement mother for his neglected child. Even after collapsing in the face of the Hanar danger and placing all hope in her to save Julian, he caressingly refers to her as “little Jennie” and promises to take charge of the family after they are married. A New England blizzard helps contain the suspense, trapping all the players in Windlake for the witches’ nightly cycle of occult ritual followed by attempts on Jennie’s life. Disappointingly, Jennie’s supernatural potential hinted at by the tarot cards turns out to be…the power of prayer? After functioning as something of a missionary to Julian, the anger of the Hanar women boils into a rage that turns against all in the household. Still, the reductive tale of a plucky young heroine engaged in battle with a trio of smug witches–and their vermin-like familiars–in a frozen New England mansion may be enough for a little seasonal gothic comfort. Lisa Stanhope, a young model tiring of the Manhattan fashion scene, flees work and a failing marriage to the refuge of a shuttered hotel in rural Jericho, Nevada, an inheritance from an uncle she hardly knew. Mark Healy, her uncle’s hotel manager, seems surprised and dismissive when Lisa informs him of her decision to stay and run the business. She also receives a less-than-welcome reception from May Thornton, the edgy housekeeper, and her mentally challenged husband, Luke. But their lack of friendliness pales in comparison to the overtly hostile reaction Lisa’s appearance receives from the local townspeople. Further deepening the atmosphere of dread, Lisa hears a mournful howling coming from the woods at night. Following a path outside the grounds of the hotel the next day, she discovers what appears to be a shallow grave in the underbrush. Seemingly uninterested in Lisa’s report, the local Justice of the Peace eventually investigates, reporting back later that only a deer carcass was found buried in the indicated plot. Walking in the woods that night, Lisa suffers–what appears to be–an animal attack. Still feeling ostracized by the community, Lisa learns from a young girl that the town has been inflicted with an unspoken tragedy, the recent unsolved murder of a child. The eventual arrival of Lisa’s estranged husband, Eddie, completes the third leg of the obligatory love triangle, since she has developed feelings for the darkly handsome Mark—whose proposal to the not-yet-divorced Lisa comes out of nowhere. However, Eddy’s presence also undermines Lisa’s strength as a protagonist, as he assumes the lead into their investigation of the murky goings-on in Jericho. A key character ultimately breaks a little too easily from Eddy’s pressure, spilling all the incriminating details, and setting up a final claustrophobic showdown in the town’s abandoned mine. 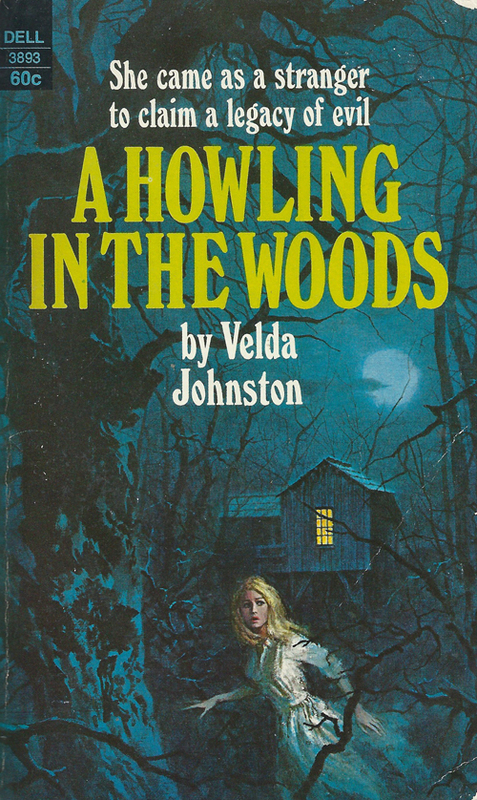 As a variation on the town-harboring-a-dark-secret theme, A Howling in the Woods is modestly effective. The mystery surrounding the titular howling is revealed much too soon, and, sadly, there isn’t some kind of monster roaming the woods at night. However, its relevance to the murder(s) works out in due course. The ultimate source of Jericho’s troubles comes off as rather arbitrary and somewhat outlandish, but there is just enough of the who-can-you-trust-in-this town type of paranoia (although who NOT to trust should be readily apparent) to pull readers through to the end of the book’s relatively short page count. 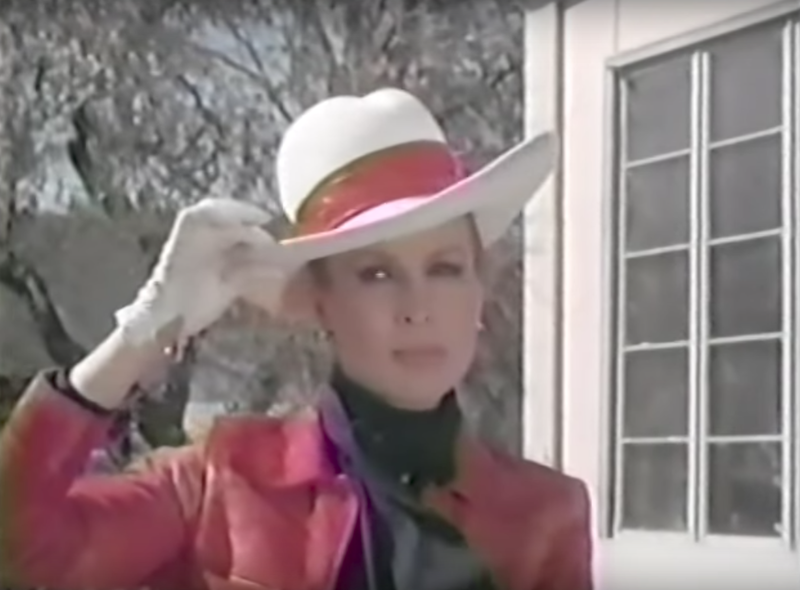 A Howling in the Woods was adapted for television in 1971, starring Barbara Eden (and her exquisite fashion sense). Cryptic flashbacks, mysterious deaths surrounding a beautiful protagonist, and dangerous former Nazi agents still at large in the scenic Austrian Alps all fail to elevate this prosaic tale of romance, lost inheritance, and murder. Stricken by a vivid case of déjà vu in a castle room during a trip abroad to Austria, young Madeleine (Del) Fisher returns home to Australia, only to be plagued by recurring night terrors. Although her family and fiancé, David, fear she has suffered an emotional breakdown, she is convinced that nightmare images of a blood-red chair and flashing silver light are repressed memories indicating a current pressing danger. Uncertain of how to handle Del’s worsening condition, David recruits the help of his uncle Mike Hornsley, a local police inspector. A strange man who has seemingly been following Del drops off a signet ring—with the family crest of the Schloss in Austria where she had her episode—along with a request for a meeting. Arriving at the prescribed rendezvous point later that night, Del finds that the man has been murdered. Convinced that the death is connected to her mysterious visions, Del and the inspector travel back to Austria in an effort to trigger her memories and uncover the source of the nightmares. In Austria, Del finds herself under the magnetic spell of Paul Hapner, who took control of the castle following the murder of his estranged family at the hands of the Nazis. Inspector Hornsley has reason to believe that Paul is hiding something, resisting any opportunity to trigger Del’s memories. Meanwhile at home, David and Del’s old friend, Marj, conduct an investigation of their own, uncovering evidence of a secret adoption. 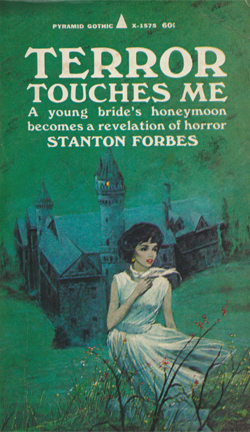 Although some gothic genre trappings are in place–the brooding castle location, a dark history which still may be influencing the present, romantic intrigue with a man who may be untrustworthy, and covert scheming for a possible inheritance—Once Upon a Tombstone never quite gels into a compelling story. Del’s vision ultimately points to knowledge already uncovered, as does the discovery of a hidden painting whose subject bears a remarkable likeness to Del. Rather than creating a tantalizing mystery in regard to their location, the prospect of lost family diamonds is finally resolved in exposition relating to the reveal of the murderer. 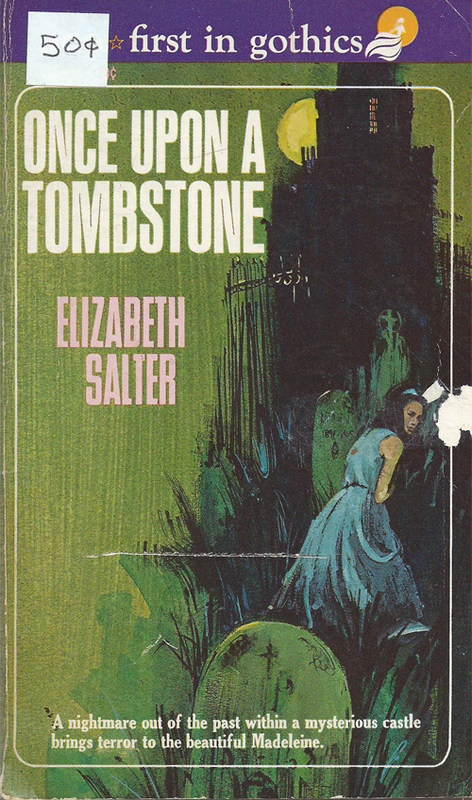 The resolution to the question of whether or not a doll was buried in place of a child in the family plot offers another missed opportunity at building an atmosphere of gloom and melancholy, which is strange given the reference in the book’s title. Even the artifice of having all the characters snowbound in the castle with the soon-to-be-revealed murderer does little toward raising the level of suspense. Readers are educated in some antiquated mid-century cultural standards, however, such as the fact that women of twenty-five are dangerously past their marriage prime, and all secretaries are secretly in love with their bosses. Young private practice nurse Diane Montrose accepts a live-in caretaker position at Ravensnest, a rambling family estate on an isolated stretch of the Maine coast. Her charges are Robyn Warburton, a sickly child plagued by chronic illnesses following the mysterious drowning death of her mother, and Robyn’s grandmother, Martha, the cantankerous matriarch whose crippling arthritis confines her to a wheelchair. Robyn’s father, David, previously absent much of the time with the operation of the family business, seems genuinely concerned with his daughter’s care—and very interested in her new nurse. However, Diane’s first order of business at Ravensnest does not pertain to the well-being of her clients. Mr. Prince, the Warburton family attorney who arranged the job for Diane, ushers her into the study to witness the signing of Martha’s new secret will. Following the conclusion of the legal matter, Diane finds herself being relentlessly questioned by Martha’s youngest son, Kerr, and step-brother, Clive, about what she read on the document, although the attorney carefully placed cover sheets over the passages of text to prevent her from discovering the identity of the new beneficiaries. During her stay at Ravensnest, Diane becomes morbidly fascinated with the mansion’s secret room, a rough-hewn space cut out of the solid rock below the waterline. Used by the Warburton’s pirate ancestors, victims from scuttled ships were placed into the chamber at low tide, and drowned by the rising water. The bodies were subsequently flushed out to sea, where they were ultimately discovered as accidental drowning victims. Diane wakes one night to the sound of violent spray on her window, as pressurized water forced out of the narrow shaft to the secret room vents against the side of the building. This nocturnal emission serves as a vivid reminder to the presence of the deadly negative space, while establishing the implication that someone or something is trapped within its confines. Otherwise, strange bumps-in-the-night and prowlers precede the eventual murder and kidnapping in a rather prosaic inheritance mystery. Only the completely expected and virtually predestined confinement in the subterranean kill room adds a flash of claustrophobic terror to the proceedings, while the obligatory romance is undercut by the fundamental creepiness of an attraction based on the resemblance to a drowned spouse. 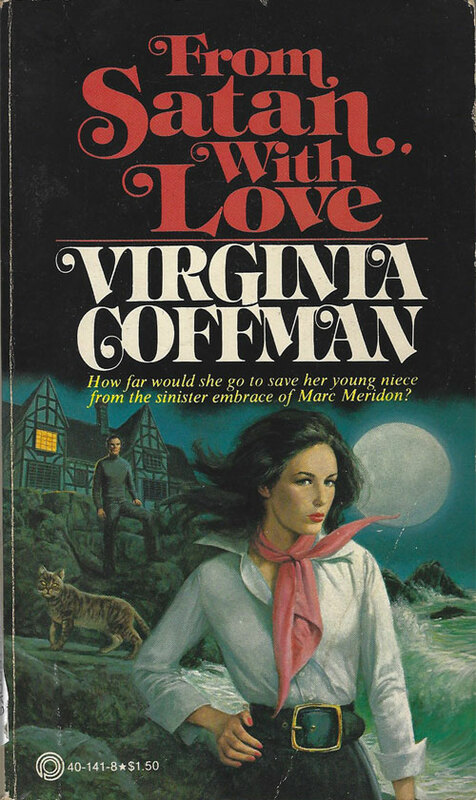 Following the death of her father, and her sister Connie’s recent marriage, Mary Owen reacts to the depressing thought of spending her life alone by impulsively marrying a man she briefly met at the wedding ceremony. Eamon Doyle, a roguish, gold-toothed Irishman and business acquaintance of Connie’s husband, sweeps Mary off her feet, and takes his new bride to live at his family’s ancestral home outside Dublin. However, other than the gray skies and peat fire in the hearth, little is made of the Irish setting. Arriving unannounced with Eamon at Doylescourt, a ramshackle castle with sprawling grounds, Mary discovers an unexpected tension amongst the family members residing there. Eamon’s father, Sean Doyle, seems engaged in a much-repeated argument regarding the future direction of the family estate with his children: Brendan, the oldest and most somber, more interested in botany than the family business; Liam, straggly-bearded bohemian and musician in a pub band; and Angela, unreadable under her cool demeanor and blank expression. Mary’s observations about the Doyles prove to be prescient. On her very first evening the entire family is stricken after a shared dinner of smoked salmon. Although Mary was unaffected, Eamon’s father collapses, and shortly thereafter dies from an unknown illness. The police ultimately trace the cause of death to a poisoned bottle of whiskey, and conclude that one member of the household is a murderer. More murders quickly follow, as Eamon’s siblings succumb one by one to mysterious poisonings. The only commonality seems to be Mary, present with each of the victims at the various times and places of their deaths. A growing suspect in the eyes of the police, Mary nevertheless confronts an inescapable conclusion—her own husband is responsible for the shocking crimes. 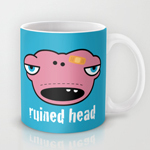 Although he is a man she barely knows, could he really be a cold-blooded killer? 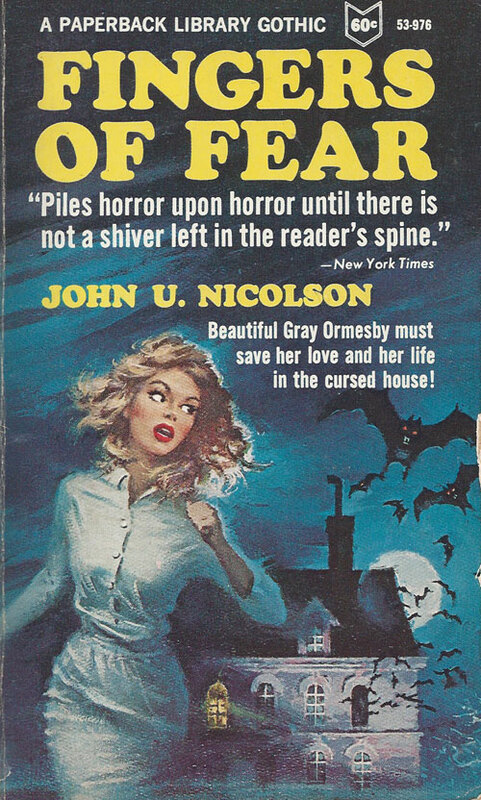 A passable entry in the newlywed-trapped-with-her-sinister-new-family category of gothic fiction, Terror Touches Me fails to generate much suspense on two fronts. Although surrounded by death, Mary never seems to be in immediate jeopardy, since she doesn’t appear to be a primary target herself. Also, even though she becomes a person of interest to the police, the dragnet of wrongful accusation around Mary as a serious suspect never closes in too tightly. 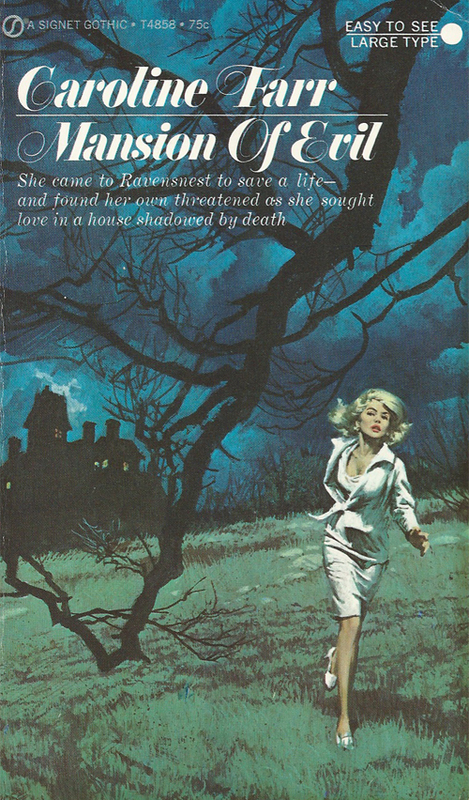 About two-thirds of the way through the story, Mrs. Ryan, the cook, professes to have heard a banshee keening outside her kitchen window, indicating a foreboding spirit lurking on the grounds of the estate. Unfortunately, nothing comes of this possible encounter—supernatural or otherwise—just a failed opportunity to lift the proceedings above the expected inheritance drama. When our young heroine, Denise Gérard, sputters out these words to Etienne Métier, a roguishly good-looking man she meets after a near-deadly encounter on lands owned by her uncle, little doubt exists that they will soon kiss, and within a hundred or so pages, be married. 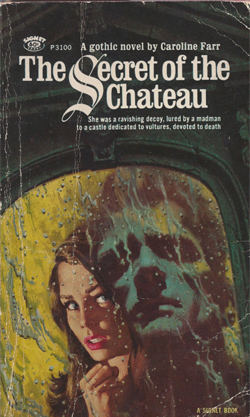 This overt telegraphing of direction characterizes all aspects of The Secret of the Chateau, a perfectly serviceable gothic thriller that holds virtually no surprises from start to finish. Denise leaves her home in New Orleans following the death of her grandfather, traveling to the Châtaigneraie region of France at the bequest of Maurice Gérard, an uncle she has never met. The reclusive Maurice, a former war hero from the time of the French Resistance, desires to re-establish contact with his last surviving family member. He advances her a large sum of money to visit him at his manor, the Château-Les-Vautours, a massive bulk that reminds Denise of a prison. Denise discovers Maurice to be a moody figure, wearing a black velvet mask to cover the extensive burns on his face received during the war, and a metal prosthetic in place of his missing right hand. She is shocked by his casual cruelty when she witness him shooting pigeons, slowed after consuming a scattering of drugged seeds on the grounds of the estate, their remains ostensibly left to feed the manor’s namesake vultures. His surly, masculine housekeeper, Gabrielle, and heavy-set chauffeur, Albert, display a barely concealed contempt for Denise, and exert an unusual hold over Maurice, seemingly out of place for their role as servants. Warned not to travel to the village alone, Denise learns of a series of strange disappearances involving young women. The countryside takes on an additional sense of menace after Denise encounters Etienne, one of Maurice’s tenants on the estate’s farmland. Etienne immediately confides his true identity to her by declaring outright, “I am an agent of the French government,” and expressing his theory that an infamous German war criminal is currently hiding in the region. All the story elements fall exactly into their prescribed places, but The [Not-So] Secret of the Chateau harbors enough of the requisite baroque trappings—a gloomy estate, a disfigured lord in a velvet mask, a group of suspicious servants, vultures ominously circling around a spot inside the forest, and a brooding mystery involving the young women of the village—to potentially provide some gothic comfort food for the inclined reader. The one-sentence tag line for this fourth outing in the occult series perfectly boils down the story to such a degree that reading its entire page count seems entirely optional. Young missionary Jean Benedict arrives at Lucifer Cover, the hedonistic spa and resort on the isolated California coast, at the request of Edna Shallert, a former member of Jean’s Disciples Revival. 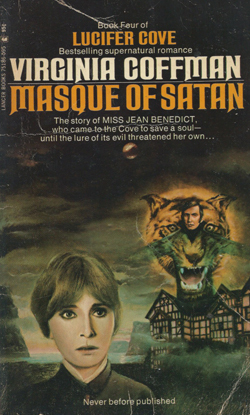 Jean’s determination to uncover the “inconceivable menace” mentioned in Edna’s letter for help is fortified when she discovers that Edna now belongs to the Devil’s Coven, a satanic temple high on the hillside above the resort. But before she has the opportunity to meet Edna, or confront Nadine Janos, the High Priestess of the coven, Jean discovers the body of Edna’s paramour hanging in her hotel room. Comforted by Marc Meridon, the darkly attractive and mysterious spa owner, Jean finds herself more and more drawn to the many luxuries offered to the residents of Lucifer Cove. Justifying her extended stay at the spa as just another mission to convert lost souls, she begins to image herself as a possible romantic rival to Christine Deeth, Marc’s current love interest. Unusual noises outside her window at night, along with the scent of freshly turned earth, hint to Jean that greater mysteries are unfolding in Lucifer Cove. Book Four of the Lucifer Cove series offers a rather straightforward tale of a naïve young girl coming to covert those tempted by the seductive offers of evil, but instead becoming the object of conversion herself. Previous readers of the series will already know what activities are taking place behind the false fronts of the Tudor-style houses lining the main street of Lucifer Cove, so any true sense of mystery is leeched from the proceedings. Returning characters, such as Nadine Janos and her Irish handyman, O’Flannery, aren’t given much of a role, and perceived villain Dr. Rossiter remains something of an enigma. Interestingly, Jean’s ultimate battle against evil hinges not on her own unwavering goodness, or a careful plan of attack against any inherent weakness in her devilish adversary, but instead on a technicality in a seemingly binding legal document—begging the question, doesn’t Satan surely have better attorneys at his disposal? 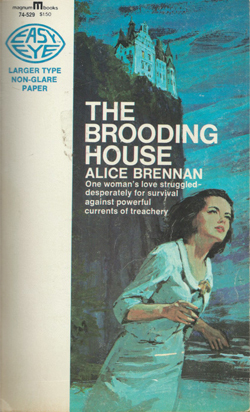 From that foundation, The Brooding House builds itself into an inheritance melodrama, with Larcy fearing that a plot is afoot to kill David for his money. She overhears incriminating snatches of conversations between Bena and a strange man on the beach, and spots her meeting with another suspicious character in the town diner. When the body of Bena’s former brother-in-law turns up at the beach, Larcy becomes convinced that evil machinations are actually underway. Strange coming-and-goings from David’s room, incriminating newspaper clippings, and the aloof housekeeper’s use of poison, ostensibly for rat traps outside the kitchen, all add to the general atmosphere of menace at the lake house. When Larcy witnesses a strange scene at the pier one night, her own safety becomes directly involved in the events. As much a nascent romance as a thriller, Larcy finds time to reflect on the nature of love throughout all the mysterious unfolding of events. Although suspicious of Bena’s actions, Larcy admires the relationship between her and her husband, Johnson, whose portrait commands attention in the house while its subject is out to sea. Larcy envies the apparent “fireworks” between the couple, evident in Bena’s emotional longing, but absent with her own prospective fiancée, Pete Crimmins.